© Tao Pattern - bone structure of Daodejing #36 (English commas added). Very simple, and very obvious... all things that exist, all have their own patterns of shapes, sizes, textures, speeds, movements, sounds, tastes, aromas, and all else that enables the things to exist. Nature rules man... Nature rules what is real within this Reality... and Nature, rules that all things, exist within patterns... to believe otherwise, is a thinking problem. Human languages are also patterned... the patterns vary for each language, the language patterns vary for each region's accents, and very distinct language patterns vary for each individual. About thirty-five years ago I investigated a group of related ideologies that included a modern ideology that claimed its doctrines originated around 600 B.C. in North America. When I read the North American doctrines, I found that the wording and mental patterns were derived from 17th century northwestern European English literature — that was itself colored with Greek and other languages that spanned several thousand years of different social and cultural periods throughout Europe — and then arranged relative to the mental and social patterns of early 19th century North American English. The doctrine's wording was also phrased from the observer's point of view, and not from the point of view that would have been given by an individual who actually experienced the thing himself as the doctrines claimed. The ideology, therefore, of course, could not have originated in North America twenty-six-hundred years ago as was claimed, and so I permanently dropped all interest in the topic. I replied with a handwritten letter to the fellow who had been kind enough to mail me a copy of the ideology's doctrines, and in the letter I briefly explained to him some of the verifiable reasons of why the ideology could not be valid. I later learned that the man had spoken well to other people of my reply — I was told that he said my letter was very courteous — and it was near the same time that the ideology's own headmasters made a public announcement that the ideology was in fact a hoax. A lot of people still follow and believe in the ideology, which is okay, but sad... the followers are mostly good enough people, but I wish for them something more than to follow other men's words. Finding an error, does not carry with it a need, nor a benefit, of publicly speaking of the mistake. All writings, ideological and historical, left open to the public, will, and are, altered, changed, and perverted to fit each generation's social beliefs. All known ideologies also possess mistakes, but usually it is favored to remain quiet, and to not speak of the errors, because, pointing at mistakes can, and does, cause hurt feelings for the people who believe their books' words to be flawless. The paragraph, changes voice patterns... no longer the rational man's voice... the new voice, contradictory... new voice, incoherent dementia. One... 'Laozi'... calm... soft, guqin rhythm... polite... mindful... thinking... self-aware... able to self-observe... written language skills, maybe not large... era, maybe, 1000 B.C., maybe much older... script type, maybe oracle, maybe another of a different, and unknown, ancient script... different region than Confucius... life history, ah, lucky man, like 南一先生 古琴... my heart is happy for his happiness... Laozi, likely a good man, likely smiled a lot. Three... scholar man... cold... stupid... not able to think... word memorizer... word-embellisher... plagiarist... copy-paste other people's words while twisting the words together into a fairy tale... life era, possibly many years after the guttural man... life region, also different than all other voices... also used socially-accepted conversational definitions of words... life history, word memorizer, pretender of being knowledgeable because able to embellish copy-pasted words... the scholar man's words, pointedly pierce Laozi's words, and permanently render Daodejing, as a whole, to be incoherent dyslectic dementia. Assemble bones... Laozi's, spine and ribs of white lamb... gutteral-gutteral man, skunk pelvis... scholar man, black jackel jaw... scholar man's words, not fit... obvious not fit... create monster. 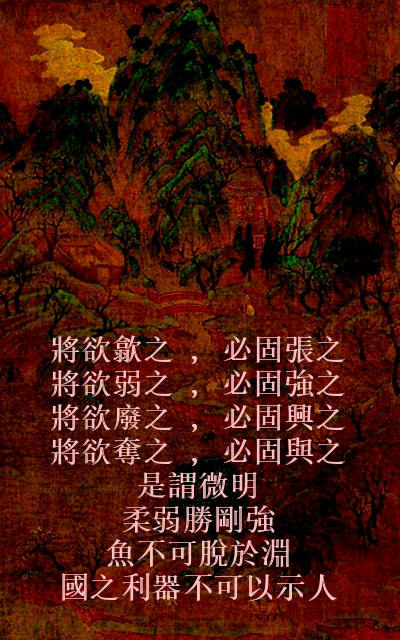 Less than half of Daodejing is of Laozi's words... and within Daodejing Chidao, I do present the known Laozi words... but, I did not previously publicly speak of the Daodejing book's errors, because it is publicly believed that various ideologies were founded upon Daodejing. However, upon recently discovering that some other people have already publicly announced that Daodejing is not of a single author, then, I will not feel too far out of balance to also speak of a few of the errors within Daodejing. I do not know what the other sources say about the mutiple voices, nor do I wish to read what the alleged sources have claimed... what I have listed, is enough. There exists another book, also claimed to have been written by Laozi... the book, is fully gutteral-guttural... crude, selfish, stupid... fully promoting an ideology that was born further to the west, while claiming that the ideology was birthed from east... the book is empty of mind, empty of heart, empty of spirit, empty of honesty, and empty of logic, but, that is precisely what the west ideology teaches to be the topmost perfect self-glory. So many writings, left open for the public to touch... all of the writings, dirtied, polluted, perverted... and almost no one cares, because, the people, selfish, cannot hear patterns of voice.